German Ifo Business Climate, US Core Durable Goods Orders, CB Consumer Confidence, FOMC Statement and rate decision, US and Canadian GDP data, US Unemployment Claims, Fed Chair Yellen’s speech. These are a few of the larger events on our calendar for this week. Follow along as we explore the Forex market movers. Last week, US data continued to surprise with a better than expected headline CPI rising 1.7% on a yearly base and 0.1% monthly in September while core CPI remained unchanged. Furthermore US unemployment claims increased to 283K but remained below 300,000 for a sixth straight week and he four-week moving average declined to its lowest level since May 2000. 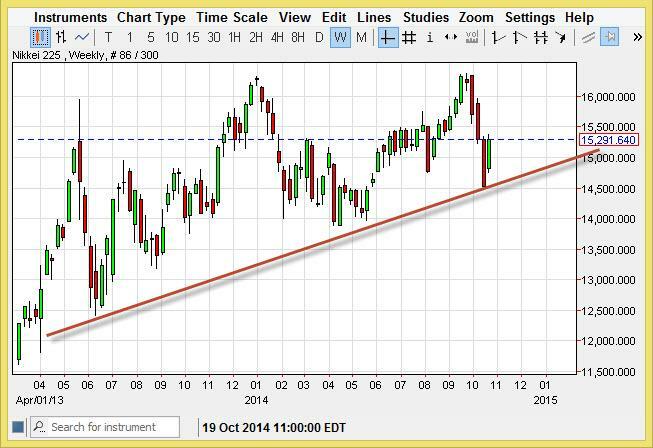 Will the strong US data continue despite the global slowdown trend? Eurozone German Ifo Business Climate: Monday, 9:00. German business climate index, based on a monthly survey of about 7,000 responders, declined in September to 104.7 from 106.3 posted in August. Economists expected a higher reading of 105.9. Sentiment worsened across the board amid the prolonged crisis in Ukraine impacting more than 6,000 German firms and the weak recovery in the Eurozone economy. Nevertheless, the German Bundesbank forecasted a positive end to the year despite the recent slowdown. German business sentiment is expected to reach 104.6 this time. US Core Durable Goods Orders: Tuesday, 12:30. US durable goods orders plunged in August due to volatility in aircraft orders. Orders dropped 18.2% after a strong rise of 22.6% in July. However the overall growth trend remained strong. Meantime, Core orders excluding transportation advanced by 0.7% in August after a 0.8% decline in the previous month. Core orders reflect the true trend, rising 17.2% in the three months to August. The rise in orders is also reflected by the constant improvement in the US job market with fewer layoffs and increase hiring. Durable goods orders are projected to gain 0.4% , while Core durable goods orders are expected to increase by 0.5%. US CB Consumer Confidence: Tuesday, 14:00. U.S. consumer confidence worsened in September, falling to 86 from 93.4 in the prior month. Economists expected a milder decline to 92.2. The strong decline may be explained by less favorable assessments of the current job market condition. Consumers expected economic growth to stall in the following months ahead. The outlook index declined to 83.7 from a revised 93.1 reading, while the present conditions index fell to 89.4 from a revised 93.9. US FOMC Statement: Wednesday, 0:00. 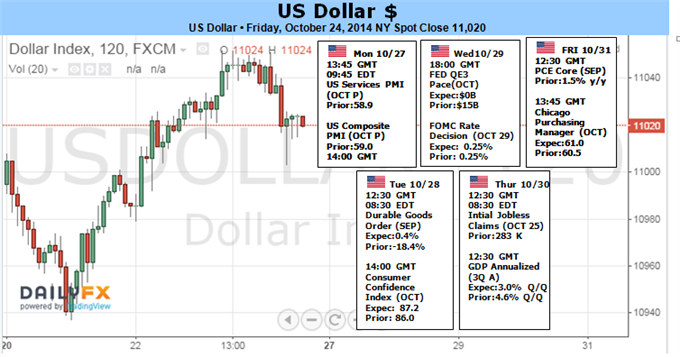 The Fed maintained interest rates and reduced its QE program by $10 billion as expected. The Federal Reserve made a hawkish statement that the period between the end of the QE program and the Fed’s first rate hike will take “Considerable time”. The Federal Reserve also released its latest Summary of Economic Projections, which shows stronger projections for rate hikes over the long run. Regarding the labor market, conditions have improved further. The Fed believes economic conditions are not sufficient for a rate hike. NZ rate decision: Wednesday, 20:00. The Reserve Bank of New Zealand kept the official cash rate at 3.5%. Governor Graeme Wheeler stated he won’t rush to raise rates as previously thought, since inflation remains contained. Wheeler also signaled a pause in the bank’s current tightening measures, indicating the bank needs to measure the impact of the four rate hikes this year. The policy statement projects slower inflation by the end of 2015. Rates are expected to remain unchanged at 3.5%. US Unemployment Claims: Thursday, 12:30. The number of new claims for U.S. unemployment benefits rose by 17,000 last week to 283,000. Despite the rise, the number of claims remained below 300,000 for a sixth straight week, indicating the US job market continues to strengthen in spite of a global slowdown trend. The four-week moving average fell to its lowest level since May 2000. However, the slowdown trend in major countries is starting to impact the US manufacturing sector. The number of jobless claims is expected to decline to 277,000 this time. Janet Yellen speaks: Thursday, 13:00. Federal Reserve Chair Janet Yellen will speak in Washington DC. Yellen may address the rate hike issue amid continued U.S. economic growth and strengthening in the US labor market. Likewise the Fed Chair may discuss the global slowdown trend which may affect the US economy in the coming months. Japan rate decision: Friday. 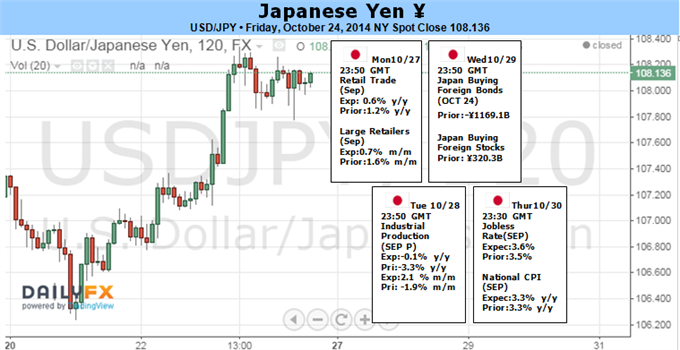 The Bank of Japan kept monetary policy unchanged at its October meeting. The Bank also unanimously decided to prolong its money market operations to raise the monetary base to an annual pace of between JPY 60 and 70 trillion and reach a 2.0% inflation rate. The central bank was more pessimistic regarding economic conditions, despite stating that the economy is continuing to recover moderately as a trend. Regarding global developments, the BOJ sees a downside risk in the pace of recovery in the US and the unclear state of the Eurozone economy. Canadian GDP: Friday, 12:30. Canada’s economy did now grow in July, from the previous month due to a slowdown in the mining, and oil and gas industries offset by a rise in manufacturing and the public sector. Mining, oil and gas industries contracted by 1.5% in July. Manufacturing expanded by 1% and the public sector by 0.5%. Economists expected a minor growth of 0.2%. This sluggish growth suggests the BOC will be on no hurry to raise rates anytime soon. The US Dollar managed to muscle out a modest advance this past week despite favorable winds for investor sentiment (through benchmarks like S&P 500 and volatility indexes) as well as a persistent dovishness in rate forecasts. Such resilience given the downgrade in its return potential and disinterest in safe havens is encouraging. However, that shouldn’t lead us to view the currency as being fundamentally indestructible. Last week was a period of respite. Reflection after the broad selling of ‘risk’ through the opening half of October is reasonable when key, open-ended fundamental themes are unresolved…and facing the kind of definitive milestones we expect in the week ahead. Both the Greenback and market-wide sentiment may finally find their cue for trend in the forthcoming event risk. From a wealth of US and global event risk scheduled through the coming week, the most potent catalyst will be the Federal Open Market Committee’s policy decision Wednesday (18:00 GMT). This will be important for the Dollar on multiple levels. It will most readily feed speculation surrounding the relative future yield of the US currency and its assets. In the past few weeks, US rate forecasts have collapsed. A combination of downgraded global growth forecasts, tepid domestic data and provocative comments from a few Fed officials has pushed out expectations for the first rate hike and the trajectory of the pace thereafter. From Fed Funds and Eurodollar futures (used to hedge interest rate risk), we find the market doesn’t entertain the chance of the first hike in the policy regime change until September 2015. Previously, the running consensus was for a ‘mid-2015’ move interpreted as the June 17 meeting. Furthermore, the pace of tightening has been downgraded so that now the benchmark rate is expected to be 0.46 percent on December 2015 and 1.36 percent come December 2016. The FOMC’s own consensus forecast for the same periods released just last month are 1.13 and 2.50 percent respectively. That is a substantial discount the market is ‘pricing in’. This severe discrepancy will shape the market’s reaction to the event itself. Given the dovish view, a ‘neutral’ outcome could elicit a strong bullish outcome for the Dollar. In this case, holding true to the central bank’s trend through its past meetings of a final Taper to the QE3 program and undisturbed consensus (cautious optimism for the economy and employment) would indicate to the market that the Fed is keeping to its schedule and the consensus forecasts they produced in September. To meet the market’s level of dovishness, we would need to see either a delay in the final Taper (highly unlikely) or a significant softening to the tone in the monetary policy statement that accompanies the announcement. What makes the upcoming rate decision even more intoxicating for the Dollar is its potential systemic influence over sentiment. Many attribute the sharp drop in global equities and other return-oriented markets earlier this month to a ‘Taper Tantrum’ – or the realization that stimulus regimes were shifting and the support for excessive risk taking was reversing. If that fundamental assessment is accurate, the Fed maintaining its path towards tightening can quickly wipe out this past week’s gains and definitively undermine a precarious market structure of record leverage, tepid participation and dependency on extremely low volatility conditions. In other words, we could see an aversion to risk that can fully engage the greenback’s safe haven quality. While much of the Dollar’s and market’s potential revolves around the FOMC decision, there will be plenty of event risk at hand. The US 3Q GDP reading and the impact to the Euro (the second most liquid currency) from a glut of important event risk should also be monitored. Yet, should push come to shove, an active response to the FOMC will override all other interests. The fundamental outlook for USD/JPY remains bullish as Federal Open Market Committee (FOMC) moves away from its easing cycle, but the dollar-yen may struggle to press fresh highs next week should the Bank of Japan (BoJ) refrain from further expanding its asset-purchase program. With the Fed’s QE exit largely priced-in, the forward guidance for monetary policy is likely to have a greatest impact on the USD/JPY, and we will favor a further appreciation in the greenback should the central bank show a greater willingness to remove the zero-interest rate policy (ZIRP) in 2015. On the other hand, the fresh batch of central bank rhetoric may drag on interest rate expectations as the majority remains in no rush to normalize policy, and we may see a larger correction in the reserve currency should the central bank look to retain its highly accommodative policy stance for an extended period of time. In contrast, market participants are still looking for a further expansion in the BoJ’s asset-purchase program as lower energy costs curb the outlook for inflation, and the Japanese Yen may face additional headwinds over the near-term should Governor Haruhiko Kuroda take additional steps to stimulate the ailing economy. However, the BoJ may stick to its current policy as the central bank head remains confident in achieving the 2% target for price growth, and the Yen may outperform against its major counterparts should market participant pare bets of seeing additional monetary support in Japan. With that said, the USD/JPY may extend the recent series of higher highs & lows on more easing from the BoJ along with a less-dovish statement from the Fed, but the pair may fail to retain the rebound from 105.18 should both central banks disappoint. The New Zealand Dollar is in for a volatile period in the week ahead as a hefty dose of domestic fundamental event risk is compounded by high-profile macro-level developments. 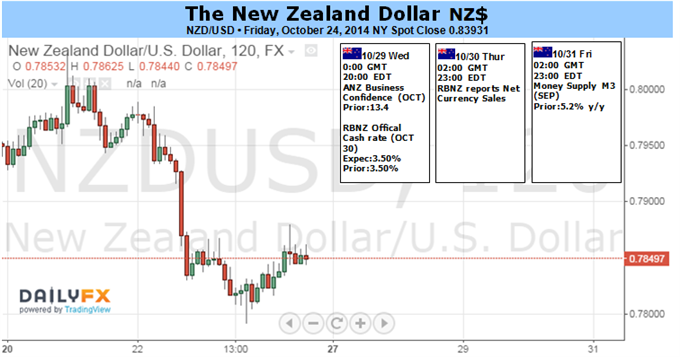 On the home front, the spotlight is on the RBNZ monetary policy announcement. September’s outing marked a shift into wait-and-see mode after four consecutive rate increases. The central bank is widely expected to maintain the benchmark lending rate unchanged again, putting the policy statement under the microscope as traders attempt to infer where officials will steer next. Last month, the RBNZ argued that while “it is prudent to undertake a period of monitoring and assessment before considering further policy adjustment…some further policy tightening will be necessary.” Since then, CPI inflation has plunged to the weakest in a year while the exchange rate – a perennial source of concern over recent months – arrested a three-month decline and began to recover. This may prompt the central bank to withdraw language signaling renewed rate hikes are on the horizon after the current “assessment period” runs its course, an outcome which stands to undercut yield-based support for the New Zealand Dollar and send prices lower. Externally, the central concern preoccupying investors is the ability of a resurgent US economy to underpin global growth, offsetting weakness in China and the Eurozone. That puts the FOMC monetary policy announcement in the spotlight. Janet Yellen and company are widely expected to issue one final $15 billion reduction in monthly asset purchases to conclude the QE3 stimulus program. The probability of a surprise extension seems overwhelmingly unlikely. That means the announcement’s market-moving potential will be found in guidance for the timing of the first subsequent rate hike inferred from the accompanying policy statement. Recent weeks have witnessed a moderation in the Fed tightening outlook as global slowdown fears encouraged speculation that the central bank will want to safe-guard the US recovery from knock-on effects of weakness elsewhere by delaying normalization. Indeed, fed funds futures now reveal priced-in expectations of a rate hike no sooner than December of next year, far later than prior bets calling for a move around mid-year. A change FOMC statement reflecting renewed concerns about persistently low inflation would validate this shift. Alternatively, a restatement of the status quo would hint the markets’ dovish lean has over-reached, triggering a readjustment and putting pressure on the Kiwi. Considering the Fed’s steady hand through the first-quarter US slowdown, the latter scenario seems more probable. 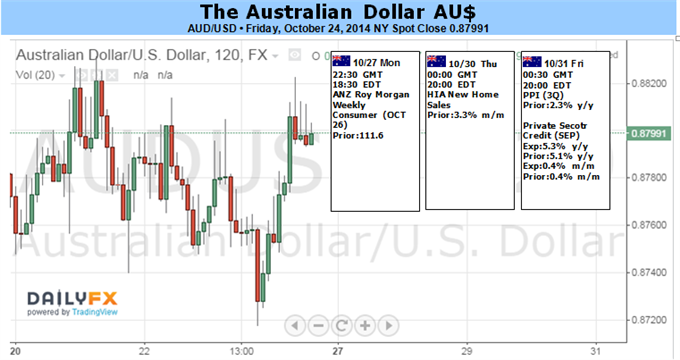 The Australian Dollar witnessed another week of wild intraday swings that seemingly found little follow-through. Traders looked past another status-quo set of RBA Meeting Minutes that reinforced the prospect of a “period of stability” for rates. Further, CPI figures remained contained within the central banks’ target range, doing little to alter steadfast policy expectations. Similarly, top-tier data from regional powerhouse, China, failed to deliver lasting cues for the currency. A light domestic economic docket over the coming week is likely to leave RBA policy bets well-anchored and see the Aussie take its cues from elsewhere. While the AUD’s yield advantage has remained robust, its appeal has waned due to elevated volatility levels. This in turn is likely to cap carry trade demand for the currency even alongside broader improvements in risk sentiment. The catalyst for the next break lower for AUD/USD is likely to emerge from the US Dollar side of the equation. The upcoming FOMC decision may offer the spark needed if the statement offers a more hawkish lean that focuses on labor market improvements, rather than subdued inflation. Speculators remain net short the pair according to the latest COT figures. Yet positioning is roughly half what was witnessed in mid-2013, suggesting the short trade is far from being “crowded”. Downside risks remain centered on the 2014 lows near 0.8660, which if broken on a ‘daily close’ basis could pave the way for a descent on 0.8320 - the July 2010 low. Gold prices are softer this week with the precious metal off by 0.55% to trade at $1231 ahead of the New York close on Friday. The losses come amid a sharp rebound in broader equity markets with the S&P 500marking its strongest weekly performance since early January 2013. Although newswires remain largely dominated by Ebola headlines, markets have largely shifted focus with all eyes on next week’s key US event risk. Looking ahead to next week, the FOMC policy meeting will be central focus with the central bank widely expected to end its asset purchase program. With headline CPI data this week coming in stronger than expected, close attention will be given to the verbiage of the accompanying policy statement as investors look for clues as to the Fed’s outlook on interest rates. The advanced read on 3Q GDP is released the following day with consensus estimates calling for a print of 3% q/q, down from the robust 4.6% q/q seen in 2Q. A hawkish tone to the policy statement on the back of the improving US data flow is likely to put pressure on bullion prices with the technical picture suggesting that prices remain vulnerable heading into the end of the month. From a technical standpoint, gold reversed off of a key resistance range defined by the June close lows, the 38.2% retracement of the July decline and the 61.8% extension of the advance from the October low at $1244/48. Although the rally reached as high as $1255, prices failed to close above and the focus remains on this key resistance range. A breach above $1248 eyes more significant resistance at $1260/63 and $1283 where ultimately we would start looking for favorable short entries. Support rests with the 38.2% retracement of the monthly advance at $1222 with subsequent support objectives eyed at $1206 and $1178/82. It’s worth noting that while this week’s price action shifts our near-term bias to the short-side, the initial monthly opening range did break to the topside and another run at the highs cannot be ruled out before the broader downtrend resumes. Look for the FOMC rate decision to offer a catalyst here as we head into the close of the month with our attention shifting to the November opening range. The Nikkei rose during the week, clearing the 15000 level again. With this, we feel that the market should continue to go higher at this point in time. 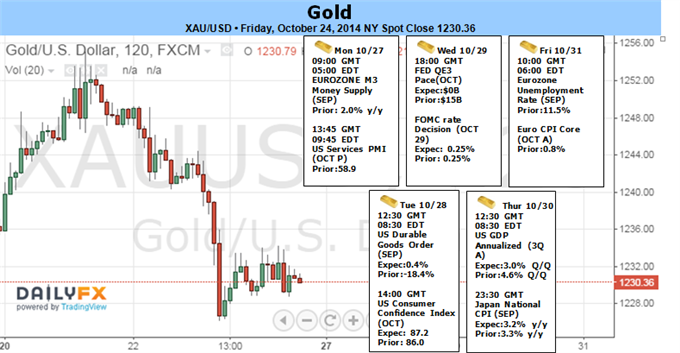 The market recently tested the 16300 level, and we feel that is where it is heading to now. The market has a bit of noise above, and we think it will be a bit on the choppy side going higher. The market should provide buying opportunities on dips as well, essentially making this a “buy only” market. The trend is higher, and we will follow it. 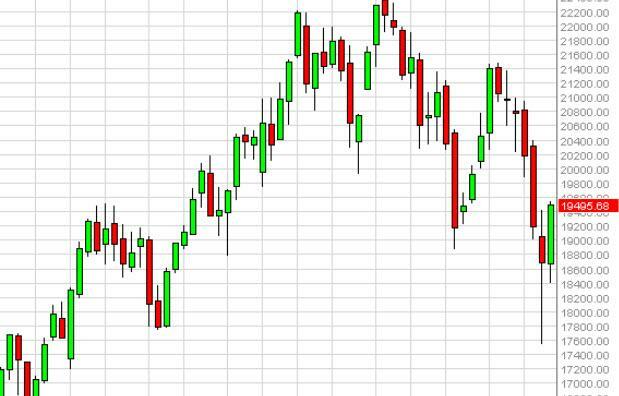 The German index rose during the week, after initially dropping down to the €8600 level. The hammer that had formed from the previous week of course was a good sign that we were going to see some buying pressure step into the marketplace, and we did in fact have that happen. If we can break above the top of this candle, which is essentially the €9100 level, we would be buyers of this market as we should then head to the €10,000 level. We don’t have any interest in selling this market at the moment. 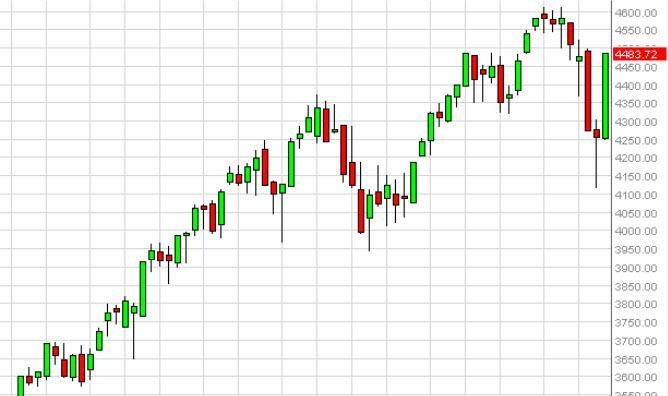 The NASDAQ as you can see broke much higher during the course of the week, clearing the 4300 level. That was the level of that was of the top of the hammer from the previous week, and of course is that is a very positive sign. This market looks like it’s ready to test the 4600 level, that being said we are very positive. With that, we feel that this market should continue to go much higher, and as a result we are most certainly buyers of the NASDAQ going forward. 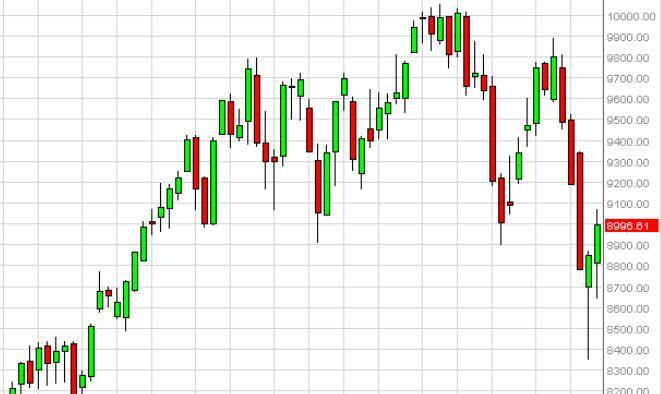 The Italian index broke higher during the course of the week, and most importantly cleared the top of the hammer from the previous week. With that being the case, we feel that this market should continue to go higher. With that, we feel that this market should continue to go as high as the 21,400 level given enough time, and then will more than likely go higher than that as we feel the market has had a significant pullback, but has most certainly shown that the buyers are returning.